The traditional water and electric meter prepayment comprehensive charge management system requires staff to operate on a desktop computer for pre-sale of water and electricity, in order to write the information(the purchased electricity/water amount/fees) into the IC card. If the staff gets off work or rests on holidays, the user cannot purchase electricity/water(Recharge), which affects the user’s normal use of electricity and water. 1. Main function and features. 1.1 Using the screen touch method, the operation is intuitive and simple. 1.2 Banknote identification, support all face value of RMB in the current market (can be modified by configuration to support the face value of the banknotes). 1.3 Network sales, multi-terminal sharing recharge information. After recharged successfully, you can check the recharge result directly on the self-service recharge machine. 1.4 Provide the recharge voucher. After recharged successfully, the recharge voucher can be printed. 1.5 High security, record the operation log. If recharged unsuccessfully, the operation history is automatically saved and fixed to the operation failure page for the maintenance personnel to judge the problem. 1.6 Full recharged process will tale voice broadcast. 1.7 Support surcharge and bundle charge when customers processing the recharge, solved the problem of difficulty in charging. 1.8 Blacklist management mechanism. Blacklist users are only allowed to recharge in the window. 1.9 Rights control, only the user's own recharge record is allowed to be queried. 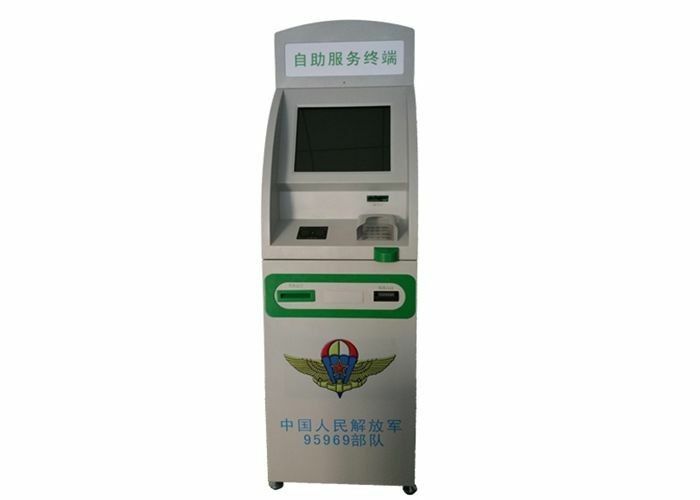 1.10 Support the statistics of the total recharge amount of each self-service recharge machine in the window every day, so as to check whether the banknotes are correctly taken out from the self-service recharge machine. 2.1 Cabinet: Cold-rolled steel plate material, hard and thick, not easy to deform. 2.2 Main control module: 17-inch touch screen, high-performance industrial computer. 2.3 Voice module: Multimedia speaker. 2.4 Monitoring module:High-definition color micro-camera, video resolution 800 × 600. 2.5 Thermal printer: Printing paper width 80 mm. 2.6 Banknotes recognizer: Recognizes 1, 5, 10, 50, 100 yuan market circulation RMB (Can set the denomination of the banknote, such as only 100 yuan); Receiving rate ≥ 98%, reading life > 1.8 million Times. 2.7 UPS power supply: Output power 500W, power backup time ≥ 15 minutes. 2.8 Input power: AC220V ± 10%, 50HZ ± 5%. 2.9 Working environment temperature: -10℃ to + 50℃; Relative temperature: 35% ~ 85%. 2.10 Card reader: Support SLE4442 card, CPU card, M1 card. 1. Supporting data reading scheme and parameter setting scheme management; The system may implement data reading and parameter setting as per the preset data reading scheme and parameter setting scheme. System Management Maintenance and management of relevant parameters of system, mainly including operator password changing, meter type data import and export. Parameter Management Meter data reading and parameter setting management, mainly including data reading, parameter setting, operation to designated meters, data reading scheme and parameter setting scheme management. HHU Management Management to the HHU related data, mainly including HHU register, HHU operator management, HHU data reading scheme management, HHU parameter setting scheme management and HHU data upload and download. Statistics Statement Supporting the enquiry and statistics by the users to the user file data, meter file data, meter data read and parameter set, capable of statement print and export to Excel for the enquired results. On-line helps HELP E-menu to assist user operation. 1. Listed company with 16 years experinece in smart meter field. 2. Annual output 4 million pieces smart meters. On time delivery can be guaranteed. 3. Support by professional and stength R&D team. 6. OEM&ODM,any your customized lightings we can help you to design and put into product.